In contrast to the large island of Koh Samui, Koh Tao is just a small island of about 21 square kilometers that offers quite a different experience to the bustling beaches and high-class spas and resorts of Koh Samui. Meaning Turtle Island, Koh Tao is renowned for its scuba diving. It is less of a backpacker destination than some other Thai islands, and has a good mix of accommodation to offer, from the more budget-friendly to the expensive and luxurious, without the big nightlife scene that you may have come to expect. So, if you’ve been enjoying the nightlife and beaches of Koh Samui, head to Koh Tao for some excellent scuba diving and a quieter pace of life. It’s about 67 kilometers (42 miles) direct from Koh Samui to Koh Tao, and the only way to make the trip between these two islands is by ferry or speedboat as Koh Tao is too small to have its own airport. Aside from the public ferries and private speedboat charters you could also take an inclusive diving tour from Koh Samui to Koh Tao if you’re just planning to go diving for a day without staying on the island overnight. Read on to find out more about all these different options. Traveling from island to island across the waters of Thailand is always very affordable when you go by public ferry. 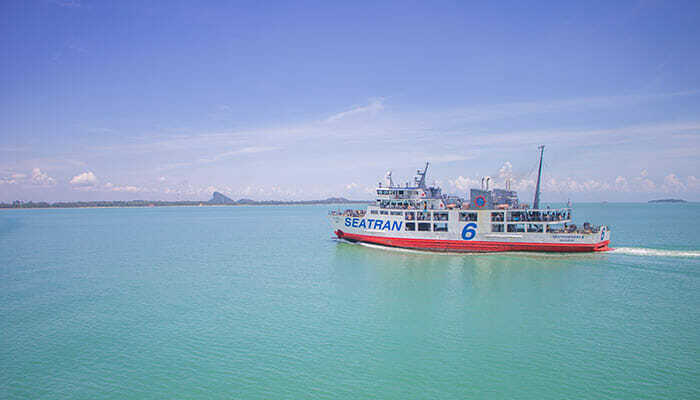 And, it’s usually the same three or four ferry companies who offer the many different routes, connecting Thailand’s islands together for both tourists and locals alike. And when each company offers several different crossings per day, there are always plenty of ferries to choose from when making the trip from Koh Samui to Koh Tao. The main difference between the ferry companies is the type of boats they are operating. Some are high speed ferries or catamarans, while others are standard ferries that will add a half hour or more to your journey time. 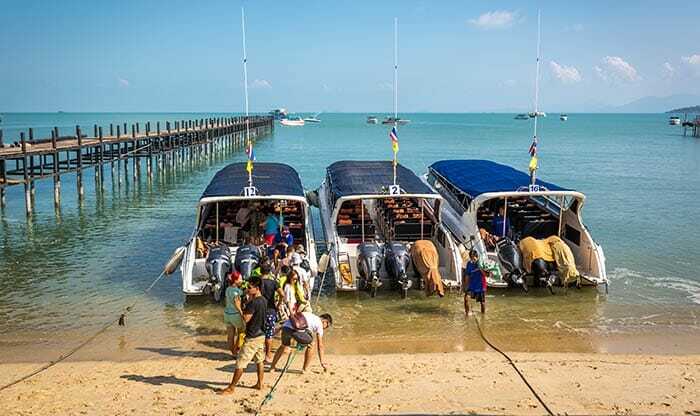 Bizarrely enough, the high-speed ferries are not usually much more expensive than the standard ferries so if you’re not bothered about saving a few hundred baht, you can choose the most convenient ferry company, depending on your departure point. Lomprayah has a high-speed catamaran ferry from Koh Samui to Koh Tao. This is the quickest way to get from A to B as it takes between 1.5 hours to 1 hour 45 minutes. Leaving from the Paralan Pier at Maenam, they arrive at the Mae Haad Pier on the west coast of Koh Tao – the only ferry pier on the island. With their newer boats, this high-speed catamaran ferry from Koh Samui to Koh Tao is nicely equipped with comfortable seating both inside and out, and a shop where you can buy snacks. There are also plenty of toilets onboard and even TVs playing movies, but you’ll want to be enjoying the scenery, not watching movies! The Seatran ferry from Koh Samui to Koh Tao is a little bit slower than Lomprayah’s catamarans, but only slightly. The journey time on these high-speed ferries is around 2 hours. Seatran ferries depart from the Bangrak pier on Koh Samui, arriving at Mae Haad pier on Koh Tao. If you’re someone who suffers from motion sickness you may find that a Seatran ferry is better than the catamaran. In choppy waters the ferries tend to be a little more stable, so do bear this in mind when buying your tickets. 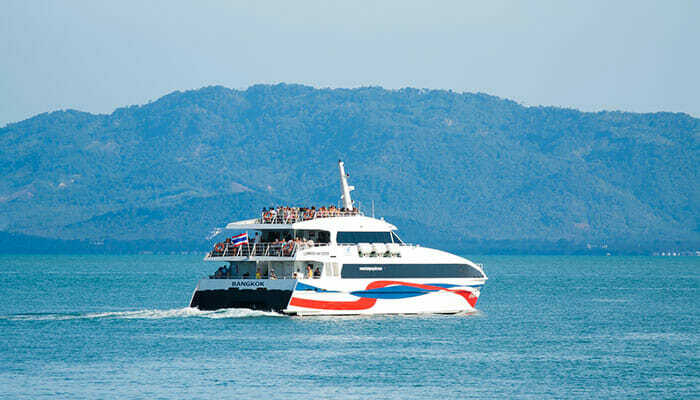 Songserm is another ferry company offering trips from Koh Samui to Koh Tao. Tickets on Songserm ferries are slightly cheaper than the other two because their ferries are a little older and slower. Journey times are around 2.5 hours and the facilities onboard are not as good. Private charter speedboats are another option. Great for small groups of travelers who like to split the cost of everything between them, the speedboats are fast and flexible as you can be picked up right from your beachfront hotel and dropped off at the beach on Koh Tao. If you’re planning to spend more than just a day on Koh Tao the ferries are a great option, however, if you’re pushed for time and would love to get there just for a day to experience some of the island’s fantastic diving, then an organized diving trip from Koh Samui to Koh Tao could be the answer. Different tours will be available depending on who you book through, but as an example, you can book a trip without needing any former diving knowledge or certification if you’re a beginner. You should expect a full day with an early start and most tours will include everything, from pickup at your hotel in Koh Samui, transfer to the ferry to Koh Tao, instructions and safety briefing, dive equipment all included, several supervised dives, lunch, and of course the ferry ride back to Koh Samui ending with your hotel drop-off. Compared to taking a ferry independently, a diving trip from Koh Samui to Koh Tao is considerably more expensive, but if you just want a day-trip to Turtle Island and you consider what’s included for the price, it’s actually a pretty good deal!